Though it is billed as ‘a promenade staging’ and the website refers to ‘mob tickets’ and ‘immersive ticket holders’, make no mistake that if you’re in the pit for Julius Caesar, you’re standing. For two hours. There’s a bit of movement, as in five paces that way or this when a new bit of the set has to wheeled into place but don’t be distracted into thinking there’s anything more on offer here than can be gotten further along the South Bank at the Globe (apart from a roof of course, which allows them to charge five times the price, or three times if you book your tickets via TodayTix). And as with being a groundling, there are decided pros and cons to experiencing theatre this way. The first half of Shakespeare’s political thriller works extremely well under this modern-dress treatment from Nicholas Hytner. As you enter the Bridge’s auditorium, reconceived into the round here, the pit is filled with a rock gig, vendors sell beer and baseball caps, a febrile energy fills the space which carries through to the arrival of David Calder’s populist Caesar with his red cap and puerile slogan ‘Do this!’ (Contemporary allusions are clear but later on you may find the mind gets weirdly drawn to Murdoch more than Trump…). What to do when you want your new film to be a new version of one of Agatha Christie’s most famous whodunnits? Well if you’re Kenneth Branagh, you call in some of your mates to play the main characters, friends like Dame Judi Dench, Johnny Depp, Michelle Pfeiffer, Olivia Colman, Penélope Cruz, Daisy Ridley, Leslie Odom Jr., Josh Gad, and Willem Dafoe. Plus you can also get some real talent to fill the minor roles – blink and you might miss the likes of Paapa Essiedu, Miranda Raison, Hadley Fraser, Adam Garcia, even Sergei Polunin. The full cast for the Bridge Theatre’s second production – a promenade version of Julius Caesar – has been announced and obviously the news that Adjoa Andoh will be playing Casca is the bee’s knees. The company is: Adjoa Andoh (Casca), David Calder (Caesar), Leaphia Darko (ensemble), Rosie Ede (Marullus/ Artemidorus), Michelle Fairley (Cassius), Leila Farzad (Decius Brutus), Fred Fergus (Lucius/Cinna the Poet), Zachary Hart (ensemble), Wendy Kweh (Calpurnia), David Morrissey (Mark Antony), Mark Penfold (Caius Ligarius), Abraham Popoola (Trebonius), Sid Sagar (Flavius/Popilius Lena), Nick Sampson (Cinna), Hannah Stokely (Metellus Cimber), Ben Whishaw (Brutus) and Kit Young (Octavius). With Network, Lee Hall’s adaptation of Paddy Chayefsky’s 1976 film, Ivo van Hove re-asserts his place as one of the premier theatremakers working, anywhere. A satire that managed to predict just how powerful a tool populist anger can be when leveraged effectively, it is transformed into the immersive bustle of a TV studio, that of UBS Evening News where old hack Howard Beale – a transcendent performance by Bryan Cranston – has been handed his notice. Though initially appearing to accept it with good grace, he causes an almighty media stir when he declares, on air, that he’s going to kill himself, triggering a most unlikely rebirth as a truth-spilling ‘prophet’. Helen Edmundson’s Queen Anne played a well-received run at the RSC the winter before last and it has now transferred to the Theatre Royal Haymarket for a summer season. It contains two excellent performances from Romola Garai as Sarah Churchill (stepping into the role created by Natasha McElhone) and Emma Cunniffe as the titular monarch and you can read my four star review for Cheap Theatre Tickets right here. The Hollow Crown reaches its climax with a solid and occasionally very strong Richard III which once again shimmers with quality and hints of artistic innovation. And for all the lauding of Benedict Cumberbatch’s starring role, it is pleasing to see Dominic Cooke and Ben Power give Sophie Okonedo’s excoriating Margaret of Anjou her due as one of the real pleasures of running these plays together is to trace her complete arc (for she’s the only character to appear in them all) and root her enmity – alongside that of so many others – in something most palpable. 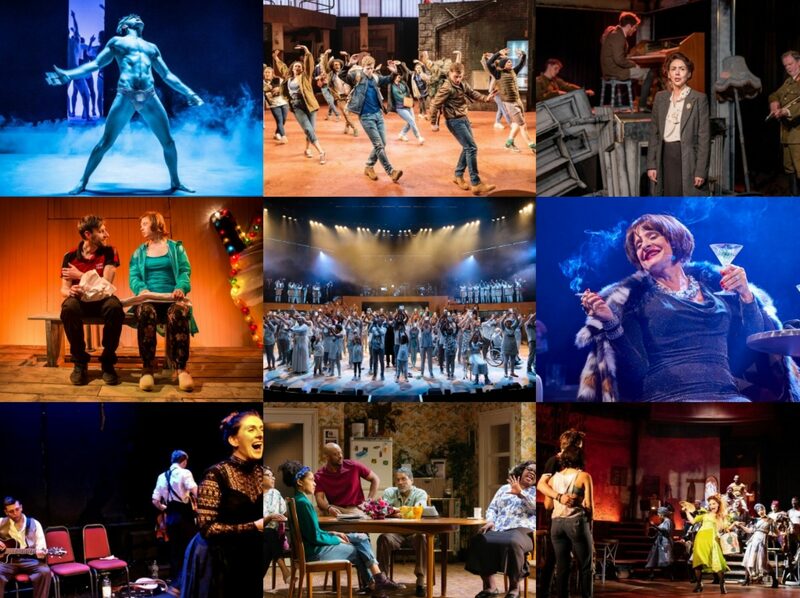 You wait for a production of relatively little-performed Shakespeare play and then three come along in the same year. Melly Still is doing Cymbeline for the RSC in the summer, Emma Rice is reclaiming and renaming it Imogen for her inaugural season at the Globe and inside at the same venue, it is being performed as part of a run of the Bard’s late plays in the Sam Wanamaker Playhouse, directed by Sam Yates. 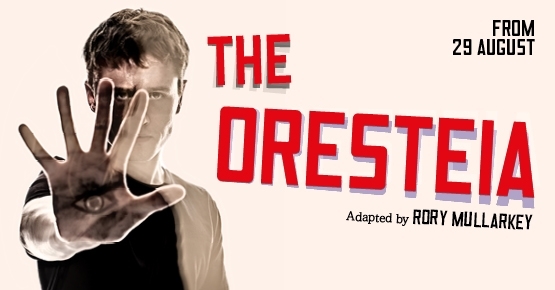 There’s something a little unfortunate about labelling your version of Aeschylus’ The Oresteia as “a radical reinvention” when Robert Icke’s extraordinary reinterpretation of the same source material for the Almeida has now successfully transferred to the West End. 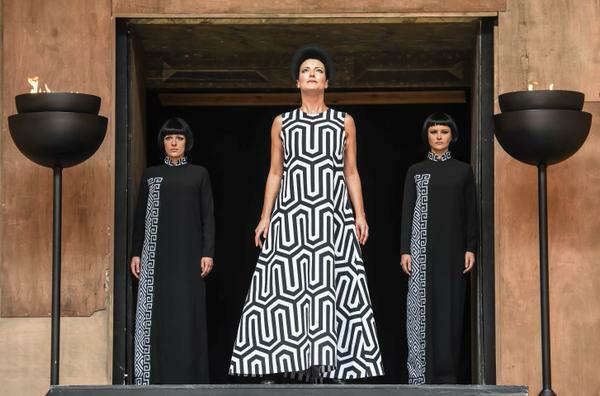 Nevertheless, Rory Mullarkey’s adaptation for Shakespeare’s Globe also emerges as something rather arresting, not least in director Adele Thomas’ canny use of creatives pushing well outside the visual (and aural) aesthetic normally associated with this venue. Hannah Clark’s design pulls on a wide range of influences to provide a wealth of striking images – niche cinema like Angelopolous’ The Travelling Players (the almost shifty looking Chorus) and Jodorowsky’s Holy Mountain (Clytemnestra’s magnificent posturing) mix with contemporary security uniforms (the opening messenger) and traditional Greek costumery as we know it (Agamemnon’s battle-dress). Along with Mira Calix’s diverse (including electronics) score, it’s an eclectic mix to be sure but one that pays off to create an out-of-time strangeness which really suits the production. Mullarkey’s textual adaptation is also an unwieldly collation of disparate elements, poetic rhythm slips into modern-day colloquialisms, epic speeches slides into operatic sung passages. The shifts may be a little jarring at times but again the cumulative effect is rather impressive. The three acts follow the woes of the House of Atreus – Agamemnon sees the war veteran suffer at the vengeful hands of his wife Clytemnestra for sacrificing their daughter, The Libation Bearers sees her suffer at the hands of her son for killing his dad and The Eumenides pops him on trial and established trial by jury, as you do. 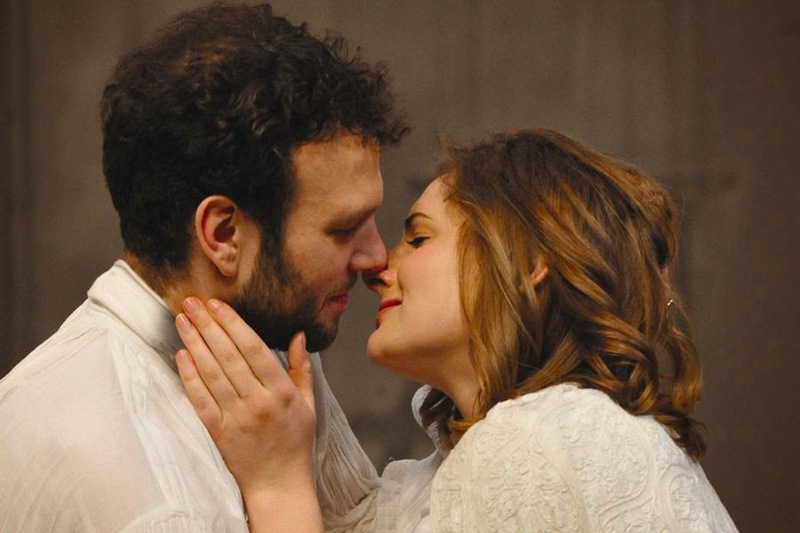 Originally seen at Shakespeare’s Globe in 2006 and 2007 as In Extremis, Howard Brenton’s newly retitled Eternal Love marks the 21st birthday year of English Touring Theatre and the first instalment in a three-year-long project to tour quality drama across the country. On a personal note, it also saw my first ever visit to Cambridge (too brief for my liking, I look forward to a return) and the Cambridge Arts Theatre (very friendly, I like the fact I found the bar before I found the box office! ).